I'm incredibly efficient today. Maybe not every day, but definitely today. 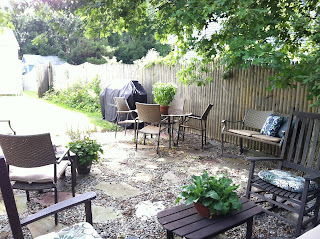 Besides going to the farm to pick up our CSA for the week, I was tired of not having my back patio set up. So, when I got home, I tackled it all. I pulled up the weeds growing through the stone patio. I sprayed Round-Up like it was going out of style to hope it won't happen again this year. I removed fallen branches- and the occasional pile of dog poop. Eewwwww. I had to cut down some large tree branches- I felt very powerful doing that, even though I had to stand on a stool to do it. I swept and cleared off the patio. I encountered a few dead mice in our garage from winter. Again, eeewwwwwww. I pulled out all of our furniture from the garage and brought it around the house into the backyard. I cleaned the glass-top table. Again, after being in the garage for 8 months, eeewwwwwww. So, what do you think?! Ready to come over for a party, or what? !